Line is a mobile messenger app with various stickers and free voice & video call over 3G/4G & Wi-Fi. This apps are really popular in Asia area because of cute characters and diverse expressions. 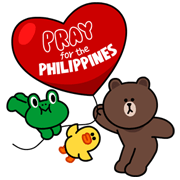 Asian messaging application Line has revealed that the sales of its sticker collection(Pray for the Philippines) have reached over $500,000 in a month. The said money will donate on the victims of Typhoon Yolanda(Haiyan) in the Philippines. The sticker set pack includes eight stickers costs around $1 and is on sale worldwide until the end of the year.